Hale-Bopp. Mmm Bop. See the difference? As regular readers will know, I’ve often got my eye to the sky for backyard astronomy. In fact, my most popular post of last year was my eloquently titled, “The Adventure foot Guide to Not Burning Up Your Retinas or Going Blind While Simultaneously Viewing the June 2012 Transit of Venus Across the Sun for the Last Time Until 2117…or How to Make a Pinhole Viewer.” That post, not to brag, (but totally to brag), was even ranked #1 on Google’s search results for 3 days. So cool. But ya know, watching the Transit of Venus or some of the other cool celestial goings-on sometimes takes a lot of preparation or complicated directions on how to view the event. Not so with the Comets of 2013! Follow your Adventure Foot out the door just a little while after sunset. 30 minutes should do. Look at the comet right next to it. It’s the bright red-ish star…with a tail. Ta-da! 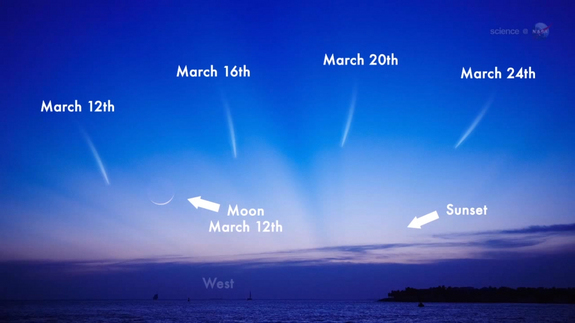 That little 2.5 mile wide hunk of rock and ice is named Comet Pan-Starrs. It was discovered in June 2011 by a team of astronomers using the Panoramic Survey Telescope and Rapid Response System (or PAN-STARRS), a telescope in Hawaii. Personally, I would have named her Dottie. Artist’s (my) approximation of comets. 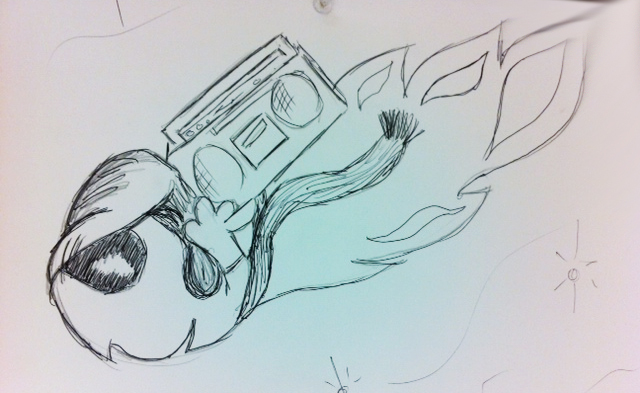 They casually cruise the solar system wearing aviators and carrying boom boxes playing Monster Ballads from the 80’s. I bet you didn’t know that. On the off chance that any of my South American friends might be reading today- there’s another comet visible in your sky tonight called Comet Lemmon, hereafter known as Comet Liz Lemmon. If cloudy skies thwart your comet viewing this week, do not fret! Another hunk of icy space junk will be blazing through the sky in November. It’s called Comet ISON and it’s making a close pass by the sun in November. This solar pass is either going to cause it to melt slowly and have a huge and spectacularly long tail… or possibly cause it to melt real quickly and be a bust. Guess we’ll just have to see. By the by- did you know that comets and asteroids are both space debris from the earliest part of our solar system? They were formed around 4.5 billion years ago out of the left-over stuff floating about. The main difference between the two is their composition: comets are mostly ice, frozen gas and some rocky material, while asteroids are metal, rock and minerals. The ice/frozen gas on a comet are what melts and creates its distinctive tail. Please also check out one of my favorite astronomy related blogs, also from last year. Click here! AND if you’re a Heartland Road Runner (or if you want to be a Heartland Road Runner): Come to Kelly’s at 6:15 tonight, run 3 miles with me, then I’ll point out the comet for you!